This smoked filet mignon is smoked steak at it's finest and unlike the sear first and then cook to the desired temperature method that is often used, I recommend smoking it at low temperature until it reaches the desired temperature then sear it after the cook. 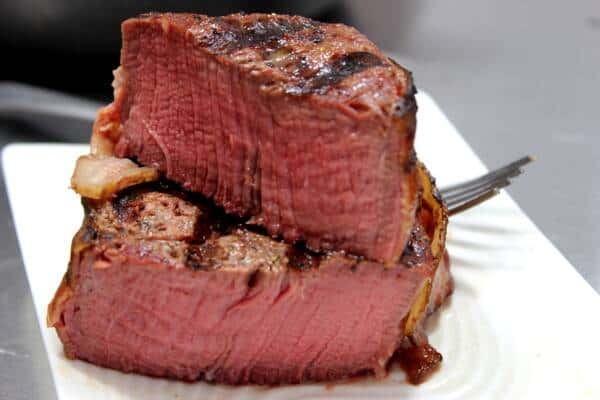 This cut is often wrapped in bacon for flavor and extra fat (since it has little fat marbling on it's own) but it is filet mignon nonetheless, with or without the bacon. You can safely omit this step if you are on a low sodium diet but dry brining adds a ton of flavor to steaks, chops and other lean meats and I highly recommend at least trying it. Dry brining is simply a method by which we sprinkle kosher salt onto meat. The salt draws moisture to the surface where it mixes with the salt and is then absorbed back into the meat. 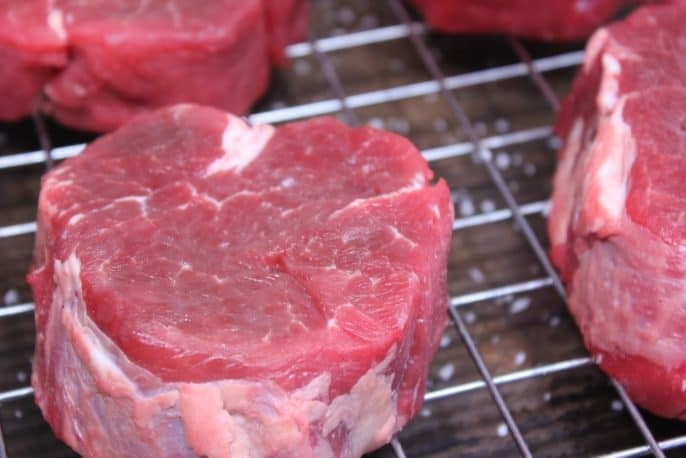 It's a lot of science that you don't have to understand in order to know that it works very well to season the inside of meat such as these beef filet steaks and turn them into the best smoked beef filet mignon you've ever tasted. 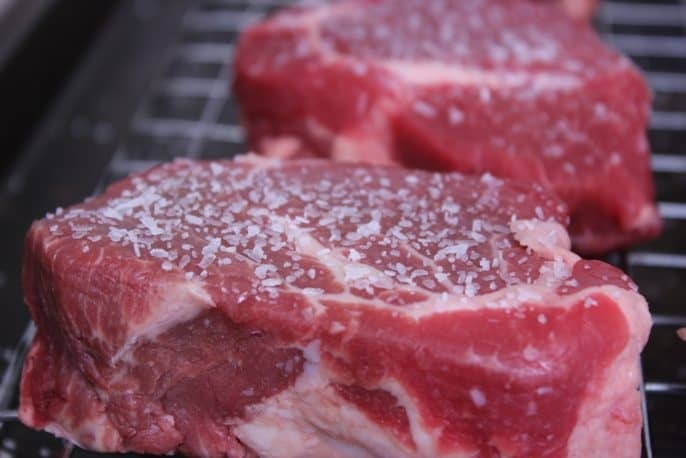 Most chefs recommend ½ teaspoon of kosher salt per pound of meat and you can certainly weigh the steaks and measure the salt precisely if you prefer but I usually just go by looks. You can look at the image below to get a a good idea of the kosher salt coverage that I recommend. Place the steaks on a cooling rack, Bradley rack turned upside down or even just a plate if that's all you have and coat the top side only** with kosher salt according to the recommendation above. **Note: This is not to say you couldn't dry brine both side if you wanted to.. this would simply require you to brine the top side first then flip the steaks over and repeat the salting and fridge time on that side as well. Note: There is no need to rinse the steaks when they are finished brining. When purchasing bacon for wrapping, it is usually best to use bacon that is on the thinner side. 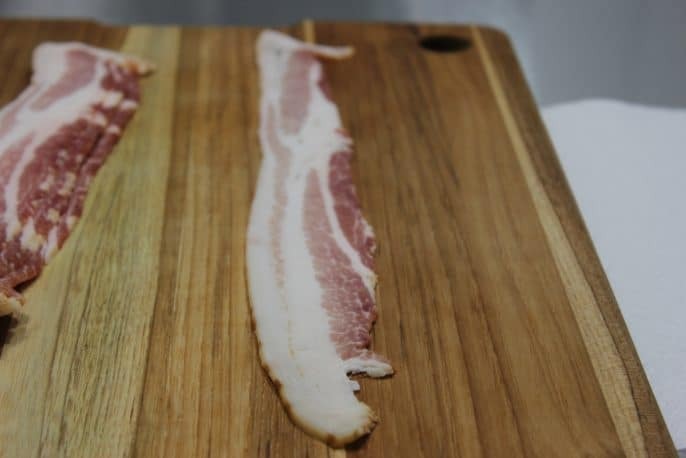 To make sure you get the thinnest bacon, count the slices per pound in the package you are looking to purchase and look for ones that have at least 15 to 16 slices per pound. To wrap the filet steaks in bacon, lay a strip of bacon flat on the cutting board. Place one of the steaks vertically on top of the bacon. Hold the front edge of the bacon against the steak as you roll it, wrapping the steak with bacon. When you reach the end of the bacon, secure with a toothpick. Repeat this process for all of the steaks. Apply a thin coat of olive oil to the top side of the beef filet steaks and sprinkle a light coat of Jeff's Texas style rub* on top. The soon-to-be smoked filet mignon is now ready for the smoker. Set up your smoker for cooking at about 225°F using indirect heat. If your smoker has a water pan, fill it up. For smoke, I recommend an oak but you can also use whatever you have. If you have the Woodwind or Woodwind SG pellet smoker by Camp Chef, then you are in for a real treat but this recipe will work on any smoker as long as you can maintain the proper temperature. 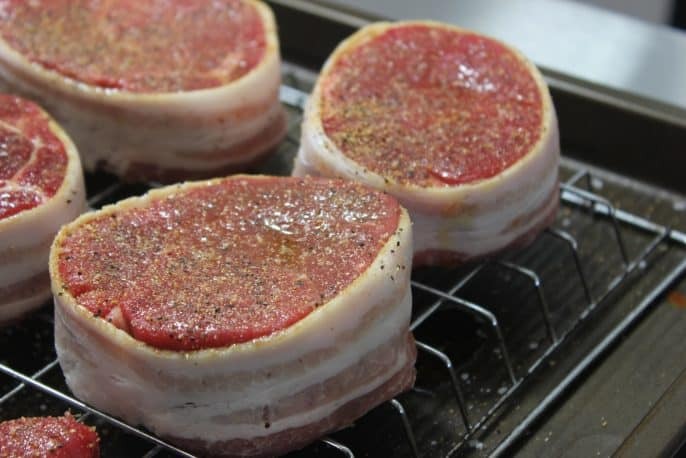 I recommend placing the bacon wrapped filet mignon on a Bradley rack, cooling rack or weber grilling pan to make it really easy to place the steaks in the smoker and then remove them when they are done but you can also just place them directly on the racks if you prefer. Expect these steaks to take around an hour but actual cook time depends greatly on, meat thickness, how cold the meat is, the outside temperature, how well your smoker maintains temperature and how often you open the door. I HIGHLY recommend using a leave-in thermometer for these so you'll know exactly when they are done. A handheld thermometer like the Thermapen also works well if you watch them carefully. I recommend medium rare for these or about 130°F in the center. Just as soon as they hit this temperature, remove them from the heat immediately. When the pieces of smoked filet mignon are finished cooking, they are ready to eat but you can take a few extra steps and make them even better including searing the outside and putting a little sizzle on the bacon. I decided to cook the bacon further with my handheld torch right away and then let the steaks cool down for a few minutes before I did the finishing sear on them so as to not raise the heat beyond their finish temperature. To do this, I simply held the flame of the torch just close enough to the bacon to make it sizzle moving it slowly all the way around the steaks. Try not to catch the toothpick on fire! Once all of the bacon is crisped up, fire up the grill or a screaming hot skillet and give each side of the steaks a little sear. I like the way grill marks look but as far as flavor and quality goes, they are overrated.. feel free to brown the entire top and bottom surface of the steaks in a skillet. Serve the smoked filet mignon as each one gets done getting its final sear and watch for some very happy faces. Sprinkle approximately 1/8 teaspoon of kosher salt on the top of each steak and place tray of steaks in the fridge for 2 hours. 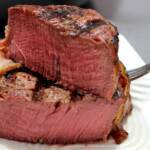 Remove steaks from fridge (no rinsing required) when they are finished brining. 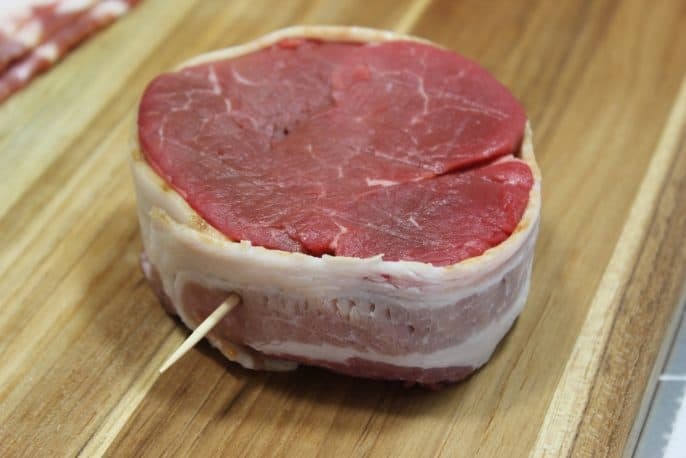 Wrap a piece of bacon around the outside edge of each steak and secure with a toothpick. Apply a light coat of olive oil and a light sprinkling of Jeff's Texas style rub to each steak. Set up smoker for cooking at about 225°F using indirect heat. Place the meat in the smoker for approximately 1 hour or until the steaks reach an internal temperature of 130°F (medium rare). Let the steaks cool for about 10-15 minutes then sear the top and bottom of each steak on a very hot grill or in a screaming hot skillet. Leave them in the skillet only long enough to brown the meat. Do not let them burn. As an option, you can use a handheld torch to crisp the bacon on the outside of each steak as 1 hour isn't quite long enough to do that in the smoker. I love Filets this way. We will add blue cheese gravy to this with Jeff’s Original.